Sizing VMware vRealize Operations Manager with Blue Medora - Möbius Business Technologies Ltd.
Sizing is important when architecting and implementing VMware vRealize Operations Manager (vROps) into your environment to ensure optimal performance. Why? Because the resources you’ll need for vRealize Operations will depend on how large of an environment you expect to monitor and analyze, how many metrics you plan to collect, and how long you need to store the data. There’s a major challenge, though, in sizing vRealize Operations – it’s difficult to predict the CPU, memory, and disk requirements you’ll need to meet the needs of your specific IT environment. There are lots of variables, such as the number and type of objects collected (which includes the number and type of adapters installed), how long data will be retained, the presence of HA, and the quantity of specific data points of interest, such as symptoms and changes, to name a few. So, when sizing vRealize Operations Manager do you know the best practices? No? Fortunately, Blue Medora can help with that. 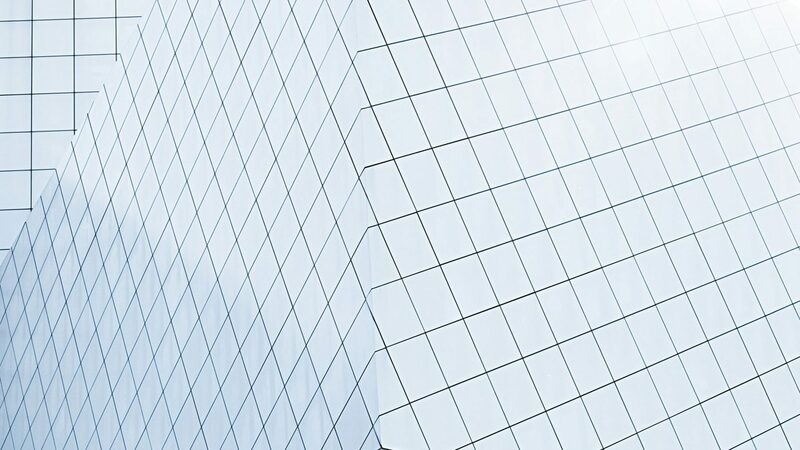 To accurately gauge how to size vRealize Operations we need to first understand how vRealize Operations takes into account sizing requirements. By default vRealize Operations is deployed on a single node, which makes this node the Master. To scale the environment as you add nodes to the cluster, you can add Data nodes/Remote Collectors to distribute metric collection. Sizing the nodes is important because this directly affects how many objects/metrics can be collected per node (a VMware article describes the maximum amount of objects and metrics supported depending on the provisioned node size). Their online documentation is helpful in projecting the properly sized node configuration based on the surmounting maximums to prevent scaling degradation. If the nodes are not sized properly and vRealize Operations Manager becomes overwhelmed you are risking longer polling intervals, performance degradation, and vRealize Operations instability. Scaling the additional nodes is imperative to scale vRealize Operations Manager in larger environments. The smallest node deployment is Extra Small (2 vCPU and 8GB memory). This configuration will only be able to sustain a maximum of 250 objects. The largest available node is currently Extra Large (24vCPU and 128GB memory.) This configuration, in comparison, can hold up to 1,500 objects, which accounts for the hefty configuration requirements. When you configure an adapter instance, vRealize Operations performs object discovery to start collecting data from the objects associated to that adapter. An object can be a single entity, such as a database, or container that holds other objects. Adding a new platform extension, like a Blue Medora management pack, is quite easy once you have vRealize Operations running. Simply login to the administration page in vRealize Operations and under solutions click “add”. If you go into Inventory Explorer within vROps you can filter the list of objects by type. This is important to note if you have a significant amount of objects, so you can validate that the environment has been right sized per the best practices. 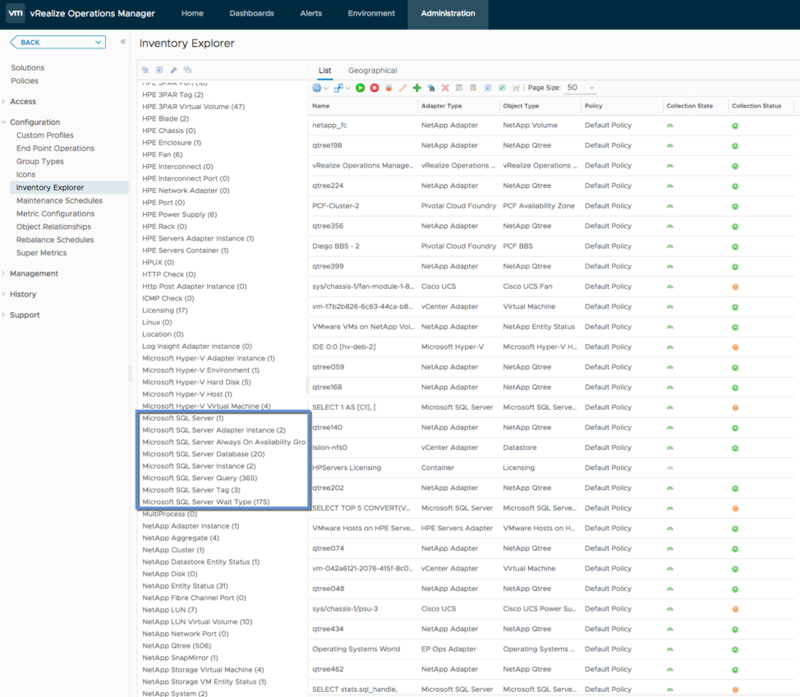 Blue Medora provides over 60 management packs for vRealize Operations that enable you to see deeper than just the VMware stack. 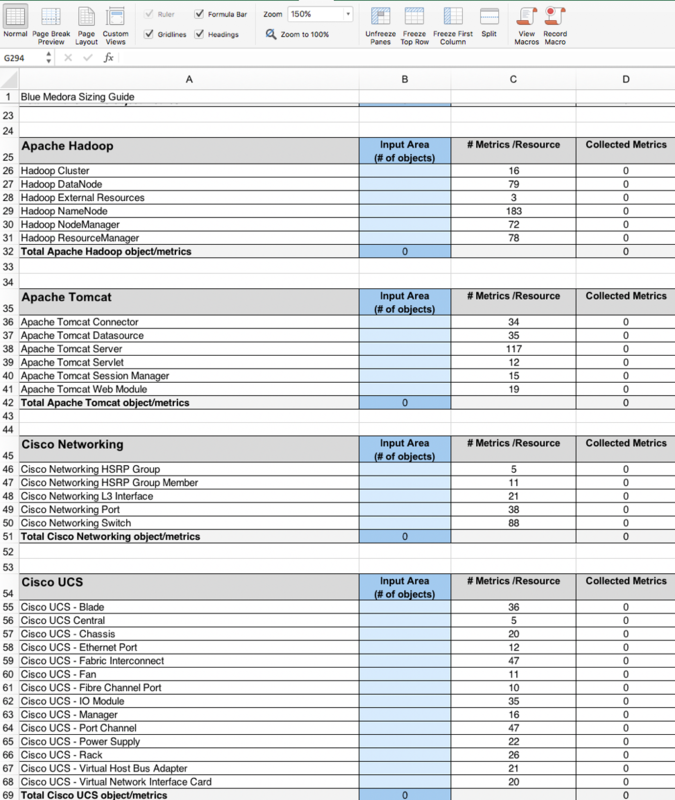 These additional objects and metrics will still be calculated into vRealize Operations separate from the existing objects for datastores, VM, and Hosts collected by the vCenter Adapter. Our guide eliminates guesswork by helping calculate how to make sure the nodes are prepared before deploying Blue Medora packs. To see the total amount of objects being collected on a node simply go back to Cluster Management in vROps to see how many objects are being collected in total after deploying Blue Medora. The number you see should not exceed the number of objects for the size of the node you created. Enterprises in all sizes and industries are discovering that vRealize Operations Manager provides an unmatched unified IT operations management platform to optimize, plan and scale SDDC and multi-cloud deployments, from apps to infrastructure. However, sizing is critical to performance. If you take the time to right size you will have the scalability needed in the future to help enable vROps to aggregate alerts across your environment. 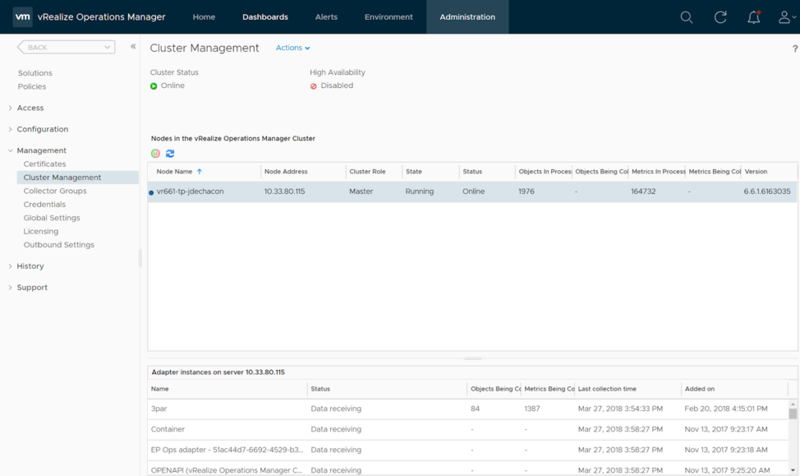 The post Sizing VMware vRealize Operations Manager with Blue Medora appeared first on VMware Cloud Management.